Quick and easy chocolate marshmallow cake recipe. 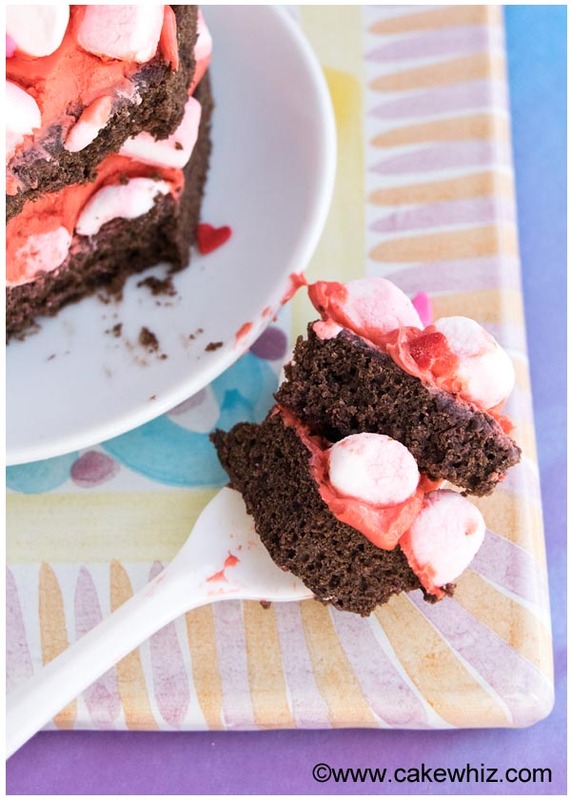 This soft and moist cake with strawberry frosting and pink marshmallows is perfect for Valentine’s day. 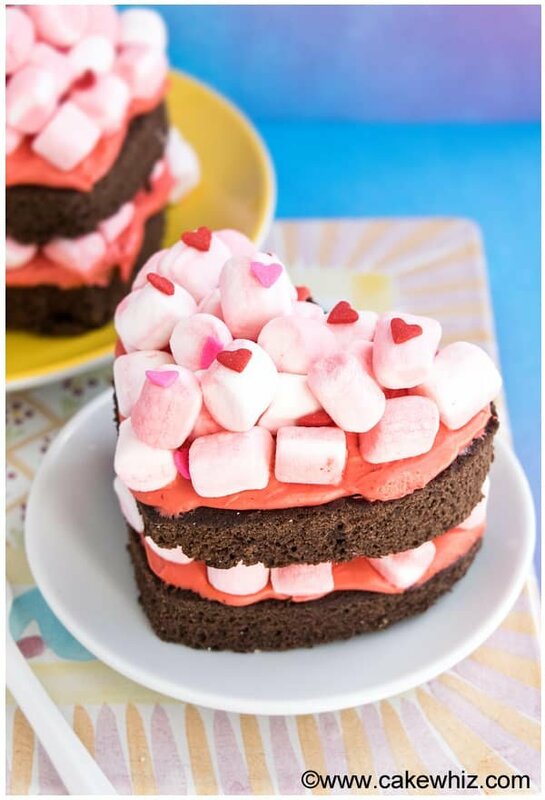 To celebrate the most romantic day of the year, let’s make this BEAUTIFUL heart shaped chocolate marshmallow cake. Shall we? I used strawberry frosting instead of just pink colored frosting coz what can be BETTER than a chocolate and strawberry flavor combination? Right?! My little cutie didn’t care for these heart shaped chocolate marshmallow cakes at all, which was kinda weird! He used a star cutter and made little star shaped cakes while I worked…lol. My husband loved them and he couldn’t stop raving about the chocolate strawberry flavor combination. Anyways, the first few months of last year were really bad for me, health-wise and I wasn’t able to share any cute Valentine’s day treats with all of you. But this year, I am healthy as a horse (I have NEVER really understood that comparison…lol!). So, get ready to see lots of romantic treats in the upcoming weeks! Quick and easy chocolate marshmallow cake recipe. 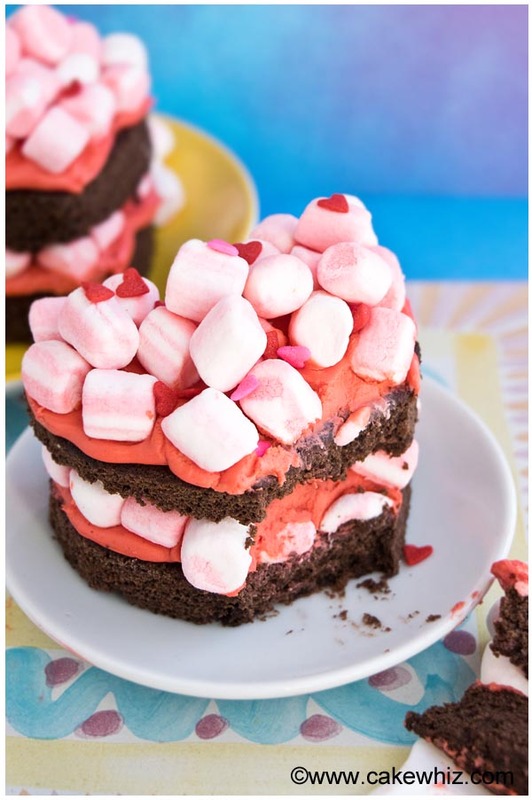 This soft and moist cake with strawberry frosting and pink marshmallows is perfect for Valentine's day. Prepare the chocolate cake in a rectangular pan. When the cake has cooled down, use a heart cutter to cut out pieces. Place one heart cake on a small plate and spread strawberry frosting on top of it. Then, stick some marshmallows into the frosting. 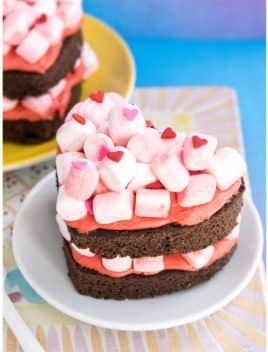 Place another heart cake on top of the marshmallows. Spread strawberry frosting on top of this cake piece too. Stick some more marshmallows into this frosting and toss a few heart sprinkles. Enjoy!